Hi! Welcome to my blog, etc., etc. As the name suggests, it’s all about dumping sugar from my (and yours if you’re interested) diet. Or at least eliminating most it. After all, life is too short, right? But life can get shorter if you indulge in it a little too much. And that can be quite a difficult challenge since sugar is everywhere (especially in the office) and sugar makes things taste so good. And the people around us indulge in it quite often. And we’re social beings, right? But I’m in control. It’s just one donut (today). We all need to treat ourselves. Besides, it’s the healthy low fat bran muffin to go with my morning grande nonfat two pumps no foam caramel macchiato. It also has blueberries so it’s even healthier. Tomorrow I’ll be more strict and never order another donut again. Then I’ll be a ripped greek god and the women will flock like geese! I’ll have a salad with low fat dressing. And a diet coke. It’s just one calorie so I’m being good. Uh oh, they are all out of diet coke. Let me see… oh, fruit juice. Ok, I’ll suffer this time. I have no energy. I feel sluggish and slow. I’ll have another little piece of candy on my co-worker’s desk. It’s small and I need to perk up. Then one day in January 2013, I came across two blog posts about the variety of effects sugar has on our health; What Sugar Actually Does To Your Brain and Body by LifeHacker and Beat the Sugar Habit: 3 Steps to Cut Sweets (Mostly) Out of Your Life by Zen Habits. There’s nothing like a good old fashioned scary bunch of side effects like insomnia, depression, hypertension, ADHD, loss of creativity, hindered concentration, obesity, heart issues, tooth decay, and many, many more. Seeing all the potential health disasters really helped me stay off sugar for 11 months of the whole year. Particularly since I’ve snacked on sugary foods all my life and was pretty sedentary. I had recently started a strength training routine in the gym and began eating healthier – metas, vegetables, and water. Surprisingly, I didn’t miss sugar, I was able to resist office chocolates, and even grew a little sensitive to birthday cake. I’ve found healthier, natural alternatives so I didn’t have to miss any dessert. Sweet! No pun intended. I was reaching my fitness goals, had more energy, more confidence, and didn’t miss sugar at all. I injured myself in the gym and with the holidays, I eventually lost my mojo. Energy levels dropped as holiday treats increased in the office, at parties, and in gift form. It’s January 18, 2014 as I write this and I’m still struggling to build back the mental toughness that I benefitted from the previous year. I’m starting up this blog to help me (and you if you’re interested) focus on the effects of sugar on my overall health and daily responsibilities. 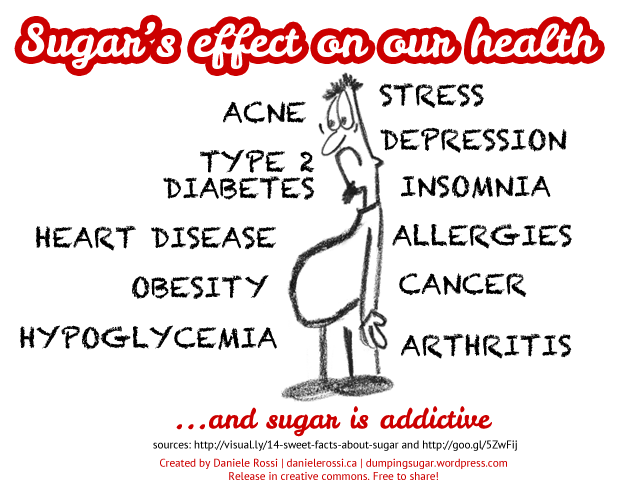 I plan on writing a post based upon a reflection of each effect sugar has. This way, I can focus on the consequences of my actions rather than the short term needs of instant gratification. That’s what mental toughness is all about. Focussing on your goals rather than the pain. P.S. All those low fat food items mentioned above just have a lot more sugar in them. Are you trying to kick the sugar habit? Leave a comment below and share your story!